Cyberjaya (8 August 2017) — In the current installment of its accelerator programme, Cyberview, the tech hub enabler leading the transformation of Cyberjaya into a Global Technology Hub continues its focus on startups in both the Fintech and IoT spaces. “The previous Cyberview Living Lab Accelerator Programme, which concluded in March saw the startups gaining a healthy dose of attention from investors during the Demo Day which we organized. I am pleased to report that discussions are currently on-going with local financial institutions and angel investors. We expect for these to conclude soon,” said Mohd Najib Ibrahim, Acting Managing Director of Cyberview Sdn Bhd. According to Mohd Najib, the latest accelerator cohort maintains the composition of a good mix of startups from both fields – three FinTech and two IoT startups. This signals the company’s continued focus on these areas, in tandem with the market’s increased appetite for FinTech and IoT solutions. Mohd Najib added that announcements made by the Prime Minister in May this year signals the government’s commitment and confidence in Cyberjaya’s ability to propel innovations and drive socio-economic growth. “We recognise that startups play a catalytic role in enriching and amplifying the innovation ecosystem here in the city. That is why we are constantly on the lookout for brilliant ideas to provide them a launchpad towards the next phase of their commercialisation. 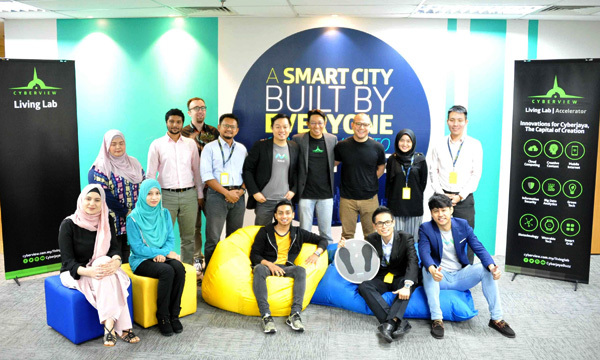 With Cyberview, startups are able to test and tweak their ideas in a real life city setting, and while these solutions will enrich our smart city ecosystem, it is our hope that these solutions will eventually be deployed in other parts of the country so that the nation as a whole is able to benefit from these innovations,” said Mohd Najib. For the second time around the cohort will be managed by Finnext Capital which as programme manager, is tasked to ensure that participants are equipped with sufficient guidance and resources throughout the duration of the programme. Finnext Capital is an innovation enabler consulting firm which provides professional advisory to both corporations and startups. It also develops an innovation ecosystem through strategic partnerships, assists in capital funding, and connects startups to opportunities through its regional-wide network. “Similar to the previous installment of the CLLA, our main aim is for these startups to be pilot-ready after the duration of the programme. That is the success measurement that we want to adhere to,” according to Mahadhir Aziz, Head of Technology Hub Development Division. He stressed that the unique proposition of the CLLA programme is the particular consideration in which solutions created by startups are well-positioned to enrich the smart city ecosystem in Cyberjaya. The Cyberview Living Lab Accelerator offers its cohort a programme value of RM50,000 which comprises of resources, facilities, mentorship, networking and market access opportunities and other assistance. Shortlisted startups of the programme are primarily working out of CoInnov8, the collaborative working space by Cyberview. Apart from gaining guidance and the exposure needed from working at CoInnov8, the shortlisted startups will also be facilitated by the City Innovation Council (CIC) ); a body led by Cyberview and comprising Malaysia Digital Economy Corporation (MDEC), Malaysian Global Innovation and Creativity Centre (MaGIC), Malaysian Communications and Multimedia Commission (MCMC), Setia Haruman, and Sepang Municipal Council. “The role of the CIC is to essentially facilitate the smooth implementation of Cyberjaya Smart City Projects, including the solutions developed in our current Living Lab Accelerator Programme by identifying strategic opportunities and emerging challenges for the city as a whole,” said Mahadhir. Mahadhir added that the kind of feedback and facilitation that will be provided by the CIC will give the startups insight into the offerings needed by the community of Cyberjaya and even beyond. The five startups participating in the current Cyberview Living Lab Accelerator Programme are fintech players LuxTag, MHub, and Serv as well as IoT solutions provider Techcare Innovation and AppCable. LuxTag provides the first digitised certificates of authenticity for products (or machines, vehicles, etc) on a blockchain that are updatable, can have memos attached, and their conjoint ownership can be flexibly transferred for manufacturers and consumers alike. Unlike conventional proof-of-existence on a blockchain of most blockchain solution, LuxTag uses full-fledged accounts on the blockchain as digital certificates. MHub is a real-estate financial business platform that transforms the way mortgage bankers communicate with business partners (developers/agents) and customers in a secure environment, making the loan application process faster and easier. Serv is an automated device that manages visitors and guest management payments, from check-in to check-out. Techcare Innovation is a technology company that develops and delivers smart rehabilitation and fitness devices. ‘TechCare’ carries the meaning ‘technology that cares” and the team has always done their best in bringing great innovation to their customers since 2014. To date, the company’s inventions had won over 30 national and international awards including Best of R&D in MSC APICTA Award, World Invention Award in British Invention Show, and King SeJong Inventor awards in Korea Inventor Award. AppCable is a mobile app development company which owns JomParking that enables users to pay parking using their smartphones. At the moment the app has more than 23,000 users and is available within DBKL and Majlis Perbandaran Jasin.